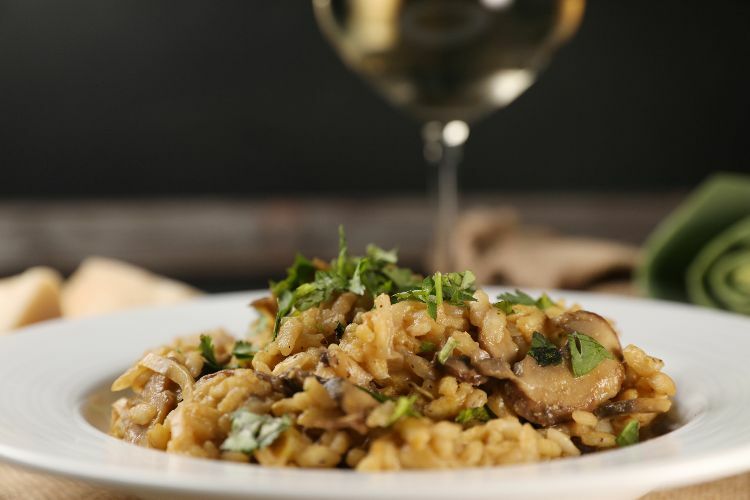 Risotto seems to be the go-to vegetarian option for most restaurants. It can be easy, however, to become tired of the dish. Most restaurants seem to make risotto so laden with butter that diners can feel sick after eating it. The recipe below solves these risotto woes because it's not only vegetarian and gluten-free, but it's completely vegan, too. If you've never made vegan risotto, you might be surprised to learn that you don't need all that butter and cheese to make this dish tasty. The risotto becomes super creamy on its own as the starches from the rice release during the slow cooking process. Throw in some nutritional yeast, and you get that "cheesy" flavor you've come to know and love with risotto. In a small saucepan, heat the vegetable broth over medium-high heat. Once it simmers, reduce the heat to low and keep warm. Meanwhile, in a large saucepan, heat the olive oil over medium-high heat. 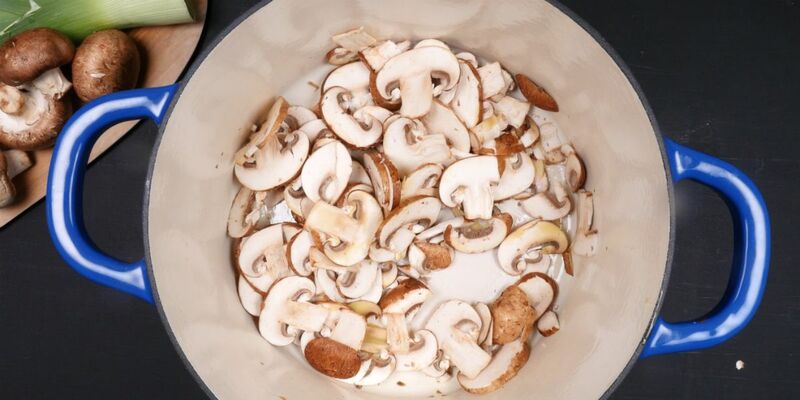 Add the mushrooms and season with salt and pepper. Cook until browned, about 5 minutes, stirring frequently. Add the leeks and cook until softened, about 3 minutes. Add the rice and cook for 1 minute, stirring to coat. Add the white wine and cook until the liquid has absorbed, about 2 minutes. Add the warm vegetable broth one ladle at a time, stirring constantly, cooking until the liquid is absorbed before adding the next ladleful. Keep the heat at medium so the mixture simmers but does not boil. Continue adding the broth until the rice is cooked through, about 20 minutes. Remove the risotto from the heat and stir in the nutritional yeast. Serve the risotto into bowls, and garnish each bowl with the chopped parsley.